In the traditional approach, starting with primary stage teaching to college teaching, most class time is spent with the professor lecturing and the students watching and listening. The students work individually on assignments, and cooperation is discouraged. 1- Active learning, in which students think, pair, share, solve problems, answer questions, formulate questions of their own, discuss, explain, debate, or brainstorm during class. 2-Cooperative learning, in which students work in teams on problems and projects under conditions that assure both positive interdependence and individual accountability. 3-Inductive teaching and learning, in which students are first presented with challenges (questions or problems) and learn the course material in the context of addressing the challenges. Inductive methods include inquiry-based learning, case-based instruction, problem-based learning, project-based learning, discovery learning, and just-in-time teaching. Student-centered methods have repeatedly been shown to be superior to the traditional teacher-centered approach to instruction, a conclusion that applies whether the assessed outcome is short-term mastery, long-term retention, or depth of understanding of course material, acquisition of critical thinking or creative problem-solving skills, formation of positive attitudes toward the subject being taught, or level of confidence in knowledge or skills.
" I hear and I forget. I see and I remember. I do and I understand.” This holds true, especially with regards to activity-based learning techniques. Activity-based learning encourages the child to learn through experimentation and exploration. The sensory experience and action make the learning better and more impactful. This leads to an exciting journey of discovery and enhanced understanding. 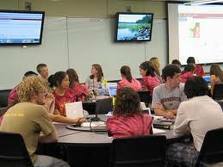 Active learning in schools and colleges is the basis of an education with a good quality. It is the right way to reform an education system all over the world. It must replace any system that depends on attainment , lecturing or teacher self- centered method. Attainment depends on memorization, but active learning depends on collaboration and group work. Discussion, giving demonstration, dramatization, a talk and accessing to real things and real experiences beside doing and interaction lead to an active learning. The classroom activities are the basis of active learning. By getting the child actively involved in their own learning, the activity-based learning model encourages students to be independent thinkers, analyze the task at hand, think critically and solve problems to come to the final learning. Being involved in these tasks encourages the child to be more inquisitive and develop their analytical and problem-solving skills. Many college teachers today want to move past passive learning to active learning, to find better ways of engaging students in the learning process. But many teachers feel a need for help in imagining what to do, in or out of class, that would constitute a meaningful set of active learning activities. 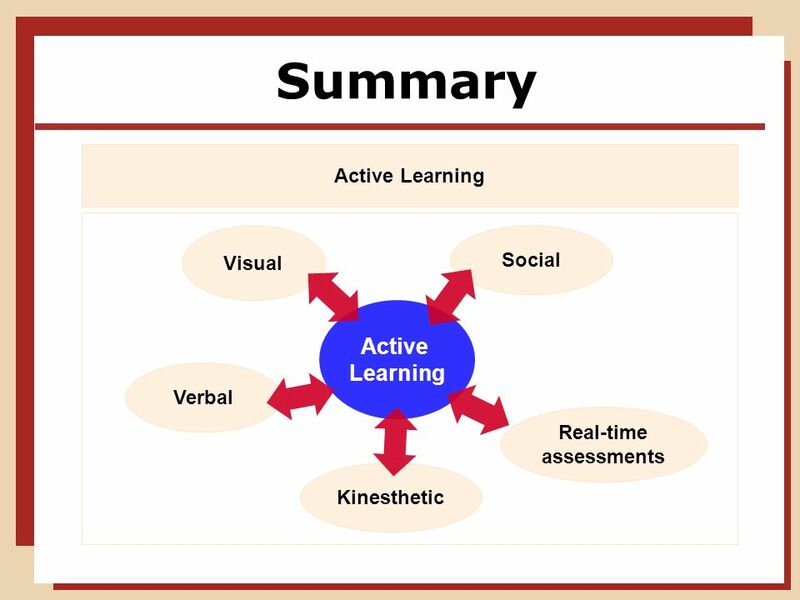 I will refer to a model example done some western experts to show the role played by the active learning to change learning from being passive into active one. This is what happens when a learner thinks reflectively about a topic, i.e., they ask themselves what they think or should think, what they feel about the topic, etc.The learner must explore the information by himself asking himself a lot of questions: HOW this happens, why" where and when? Then he resorts to resources of knowledge in the school library , the internet and find the means that help him to reach the objective by himself as an independent learner as if he were a researcher. This is "thinking about my own thinking," but it addresses a broader array of questions than just cognitive concerns. A teacher can ask students, on a small scale, to keep a journal for a course, or, on a larger scale, to develop a learning portfolio. In either case, students could write about what they are learning, how they are learning, what role this knowledge or learning plays in their own life, how this makes them feel, etc. There must be a kind of a dialogue between the learner and himself. He thinks, how he can apply this and how he can reach to that , where? How come ? it is a kind of self- talk. The learner listens to his teacher, notices everything, follows his instructions and tries to follow in his footsteps. Suppose it is a science lesson in the science lab, the teacher performs an experiment and the learner listens, watches , observes, waits to see the results then tries to do the same practically by himself. This occurs whenever a learner watches or listens to someone else "Doing" something that is related to what they are learning about. This might be such things as observing one's teacher do something (e.g., "This is how I critique a novel. "), listening to other professionals perform (e.g., musicians), or observing the phenomena being studied (natural, social, or cultural). The act of observing may be "direct" or "vicarious." A direct observation means the learner is observing the real action, directly; a vicarious observation is observing a simulation of the real action. For example, a direct observation of poverty might be for the learner to actually go to where low income people are living and working, and spend some time observing life there. A vicarious or indirect observation of the same topic might be to watch a movie involving poor people or to read stories written by or about them. Again, "Doing" may be direct or vicarious. Case studies, role-playing and simulation activities offer ways of vicariously engaging students in the "Doing" process. Since the child learns by performing tasks independently or in groups, the activities invariably instil a sense of confidence in the child. The child learns to rely on their own understanding and skill-sets and feel more confident; not only in the educational environment but outside as well. To take one example mentioned above, if one is trying to learn how to conduct a high school band, direct "Doing" would be to actually go to a high school and direct the students there. A vicarious "Doing" for the same purpose would be to simulate this by having the student conduct a band composed of fellow college students who were acting like (i.e., role playing) high school students. Or, in business courses, doing case studies is, in essence, a simulation of the decision making process that many courses are aimed at teaching. Division: Divide your learners into groups. Leave the traditional learning that depends on recitation and give instructions of group work to practise collaborative work. The most traditional teaching consists of little more than having students read a text and listen to a lecture, a very limited and limiting form of Dialogue with Others. Consider using more dynamic forms of Dialogue with Others and the other three modes of learning. Helping students observe the subject or action they are trying to learn. Give a chance to your learners to think and practise by themselves. The previous steps enable learners to share, do and interact. Interaction plays a big role in the process of the real learning. 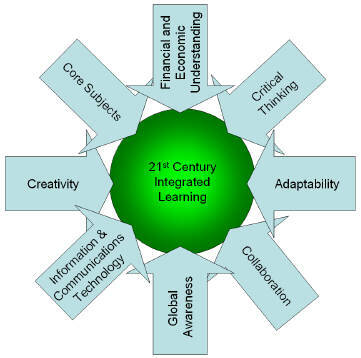 Learners can be interactive and thereby multiply the educational impact. For example, if students write their own thoughts on a paragraph or a composition, before they are asked to discuss it in group the group discussion should be richer and more engaging. If they can do both of these and then observe the phenomena or action (Observation), the observation should be richer and again more engaging. Then, if this is followed by a kind of practice using real things of daily life, they will have a better sense of what they need to do and what they need to learn during doing. Finally if, after Doing, the learners process this experience by writing about it (Dialogue with Self) and/or discussing it with others (Dialogue with Others), this will add further insight. Such a method will give the teacher and the learner the opportunity of interaction as a method of teaching. New experiences (whether of Doing or Observing) have the potential to give learners a new knowledge on what is true (beliefs) and what is good (values) in the world. Dialogue (whether with Self or with Others) help learners know the many meanings of experience and the insights that come from them. The teacher can observe the learners activities and reach to the fact that his learners came to a real learning through watching that in the learners activities inside the class or outside it. Characteristics of a good teacher. Teacher's Toolbox.5-Rediscovering Curiosity, Imagination, and Humor in Learning. Writing for the Reader: A problem- solution approach. 1Selecting the right alternative test.